Reading the gospel accounts it is clear that Jesus spent a fair amount of his ministry eating. Whether he’s having private meals with his disciples, picnicking on a hillside with a few thousand listeners, inviting himself or getting himself invited to dinner, or barbecuing fish on a beach, the gospels record a substantial number of mealtime occasions. Clearly there must have been many, many more meals which are not specifically recorded, but which are part of the same pattern. For Jesus some of these meals were teaching opportunities, occasions to share with his fellow diners a story or parable or some other teaching. But they were more than just this. Quite a few of the meals are in the houses of outcasts — tax collectors, collaborators, the ritually unclean, adulterers, and other sinners. Jesus preached the good news of joy, peace, social justice, freedom from our slaveries; that in God’s kingdom our sins can be forgiven, are forgiven. So when Jesus sat down and ate with outcasts he showed — to everyone who was prepared to see it — how near God’s kingdom was, how it was already here among us. He showed how it was possible to live in God’s kingdom of social justice and reconciliation. Forgiveness was actualized. In the social aspect of sharing a meal together and being prepared to accept one another, to give and to receive forgiveness, to be reconciled to one another: in doing these things we can glimpse the kingdom, and indeed not just glimpse it but enjoy a foretaste — the kingdom in action, right here and now. And that brings us back to the liturgy. Jesus’s disciples continued to share their meals as an enactment of the justice and peace of the kingdom of God, and in doing so they recognized the continuing presence of Jesus as they broke bread together. This meal continues to this day, whenever Christians gather together and share bread and wine in remembrance of Christ: Christ is present, forgiveness and reconciliation are given and received, the kingdom is brought into existence. This then is our vision of the Eucharist. It is a vision that the Church sometimes seems to understand only very dimly, perhaps because the Eucharist — and Christianity in general — has become overlaid with so many ideas and practices that add ‘religious’, ‘ceremonial’ and ‘ideological’ complexity. Some of those layers can be helpful, and others may be less so. Here we are concerned primarily with liturgy, and how the kingdom of God is proclaimed and lived through the liturgy. 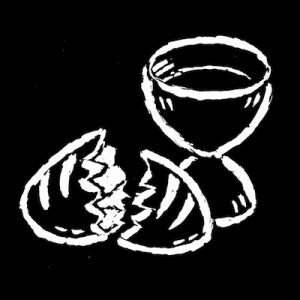 How does the Eucharist exemplify the kingdom? What kinds of practice are useful? What do we need to recover, in our language and our ceremonial? What do we need to preserve, or enhance, what do we need to lessen or jettison? How has the liturgical revision of the last hundred years helped or hindered? Quite likely we shall conclude that there is no single answer, but different emphases in different contexts, with some limits, and suggestions for a range of ‘normal’ usage. But this is our starting point: the proclamation of the good news and the recognition of the presence of Christ in the shared meal where all are welcome, where the hungry are fed, and where sins are forgiven. illustration by Leigh Hurlock, from Gathering for Worship, Canterbury Press, 2005, 2007; used with permission. The ‘Octave’ from the feast of the Conversion of Paul (25 January) to Candlemas (2 February) was an eventful one for the Church of England. York Minster was the venue for the two episcopal ordinations (or consecrations) which were the focus of this eventfulness. It provided the Minster with a wonderful opportunity to demonstrate why English cathedrals have experienced such growth over the past decade. The fusion of space, music, movement and colour merged to provide that elusive and indefinable, but tangible, experience we often describe as ‘transformative’. The balance, pace (and timing) left you with the craving to come back for more. Peter Moger, the Minster’s Precentor, deserves buckets of sympathy and admiration in equal measure. It requires a certain degree of insight and experience to craft acts of worship such as these, where the overall impact is memorable — as opposed to being overloaded and exhausting. In a previous life, I was responsible for arranging several consecrations in the southern province. I know the complicated terrain intimately: the reciprocal horse-trading; the endless telephone calls; the missed deadlines; proof-reading in the wee small hours; managing conflicting expectations; not to mention the sleepless nights. These are all inescapable in the build-up to these occasions. Despite the fail-safe rehearsal plan, there is always the potential for ‘something’ to go awry on the day — objectors notwithstanding! My concern is with the strikingly different manner in which liturgical presidency was modelled at the two consecrations. The pretext for this difference is well known and hardly needs rehearsing here. However, it was more than apparent that, behind all the agonised exegesis of the Five Guiding Principles and the desire to model generous restraint, something vital was lost in the second of the two consecrations. The cohesive shape and flow of the liturgy felt as if it was creaking under the weight of unrealistic expectation — precisely because the presidential modelling seemed disorientated. The unity of the liturgy is served by the ministry of the president who, in presiding over the whole service, holds word and sacrament together [my italics] and draws the congregation into a worshipping community. The president … expresses this ministry by saying the opening Greeting, the Absolution, the Collect, the Peace and the Blessing. The president must say the Eucharistic Prayer, break the consecrated bread and receive the sacrament on every occasion. The Archbishop’s modelling of this ideal felt organic, innate and contributed to a sense that, as the congregation was carried by the peaks and troughs of the liturgy, as different voices spoke, silences emerged, processions moved and music intensified the prayers and hopes those present, the unambiguous centre of gravity was the Archbishop as liturgical president. In the second consecration (Philip North’s) it was far less clear how the unity of the liturgy was being served. Some will say, inevitably, that the lack of presidential cohesion experienced on this occasion was an all-too-real reflection of the uncharted ecclesial, liturgical and theological territory being negotiated. But need it have been so? Quite often, it felt as if the fundamental question of how presidency of the whole liturgy would be expressed to give unity and cohesion to a great celebration, sank under the accumulation of so many other competing demands. The legal and canonical rights of the Metropolitan were well emphasised, as were questions of who would, and would not, lay hands on the candidate; not to mention the perilous prospect of treading a safe path through all the media discussion about purity and taint. The (doubtless unintended) outcome was that the Archbishop’s stated desire to model ‘gracious restraint’ was undermined by the apparently random manner in which he seemed to appropriate aspects of the presidential role. Instead of there being a centre of gravity in the liturgy, there was an impression of two bishops competing for the same space in a liturgical game of musical chairs. The one who greeted the congregation, absolved them and then blessed them at the conclusion of the liturgy, did not recite the Eucharistic Prayer, break the consecrated bread, or invite the congregation to receive communion. The notion of the unity of word and sacrament being embodied in the president was fractured. The focus of liturgical unity was obscured. I am left asking why the Bishop of Chichester could not have been granted the Archbishop of York’s commission to preside over the whole rite. The Archbishop was always going to be a visible participant, exercising his ministry at key moments (as preacher and as Ordinary who received the oaths of due obedience). Such a liturgical gesture of gracious restraint, and respect for theological conviction, would not require him to cede his authority as Metropolitan in his cathedral. But it would have enabled him to allow the unity of the liturgy to be served by the president, where the holding together of word and sacrament is embodied in one bishop, who is the centre of gravity for the worship of the whole people of God. At a less theoretical level, it is largely assumed that cathedrals exemplify good practice. And they do — York Minster included. But I have this awful feeling in the pit of my stomach that quite a number of clergy, lay readers and others from the Blackburn Diocese (and further afield) will have come away from York Minster on Candlemas day thinking that the model of ‘presidency’ they witnessed at Philip North’s consecration is a good thing (even down to wearing cumbersome copes instead of the traditional Eucharistic vestments usually worn for the Eucharist in the Minster). ‘Let’s give it a try next Sunday,’ they will be thinking! Much parish worship in the Church of England is less than the transformative experience it should be at present, precisely because there is a lack of theological insight; a paucity of spatial and artistic imagination; but most of all, confusion about what constitutes good presidency — and how good presidency enables the whole people of God to fully celebrate the mysteries of faith in the sacrament of unity. If this can be understood — and modelled properly — before the next consecration of a traditionalist bishop, it will be for the better health of the mission of the entire Church of England. Simon Reynolds is the author of Table Manners: Liturgical Leadership for the Mission of the Church (SCM, 2014). Earlier this year I attended a deanery confirmation service. In his address the retired assistant bishop who was presiding posed the congregation a question. He asked us to consider what we should do if we wanted to see the face of God. After considering various possibilities he suggested we turn our heads to left and right — to see the face of God in our neighbours. Each of us is made in the image of God; each of us is a child of God. We meet together as the people of God — a subset of God’s people who recognize that role and are able to be in that particular place at that particular time. The assembly, the community, is transformed by the act of worship, transformed by recognizing the image of God, not just in our fellow worshippers on that occasion, but by recognizing that the image of God can be found in each human being. What then does it mean that each is made in the image of God? It means a number of things, among them that each person has value, each person is of worth, as an end in themself, and not as a means to some other end. That applies both to the ‘me’ and to the ‘others’: each person needs to remember that they are made in the image of God, and that everyone else is also made in the image of God. And it applies regardless of whether the other person recognizes it. These are the people who come together regularly Sunday by Sunday, or perhaps occasionally; these are the people who together constitute the eucharistic assembly. They come in faith and hope in order to worship and celebrate together, responding to Jesus’s call to sinners and outcasts to sit with him at God’s table. Week by week, together they constitute the ‘church’ in that place, the local ‘ecclesia’. They come together as the children of God, the people of God, made in God’s image. They are nourished, doubly so, by the Word of God. And they go out as the Body of Christ. They come together as individuals, children, people. They are transformed by worship into one corporate group, one body. They do not gather just to watch or listen to a show or a performance, to a great preacher, or a wonderful choir, or an inspiring concert. They do not come to participate from the sidelines like a football crowd cheering their team on. The liturgy is not some spectator sport or piece of theatre. Nor, equally, do they come to make private individual devotions, a private relationship between each worshipper and their God. Instead, each member of the assembly is important and has a role to play in what the assembly does as a whole; each person is an active participant in the corporate worshipping group — because each is made in the image of God. The action of each member of the assembly, that common purpose, constitutes them as the assembly, and that person as a member of it. Within the assembly different people have different roles. Some may read, some may lead intercessions, others may lead singing or play musical instruments, someone will preside and others assist, someone will preach. Others will participate by joining in various responses, hymns and songs. Each of these (and other) roles is a ministry, an act of service to the assembly, an act that facilitates and enables the worship of the whole assembly to take place. Some of these roles will have formal appointment, and others will be by informal agreement of the assembly. Either way, they perform their roles within the context of, and with the explicit or implicit agreement of the assembly. Some of these roles help to constitute the assembly itself, in particular the role of president or presider. Together all these people, convened for this purpose, form the eucharistic assembly, the local church, the ecclesia. The adoption by the early Christians of the word ‘ecclesia’ to describe their assembly indicates both their past and their future. The ecclesia (Greek: εκκλησία) was the term used in ancient Greek city-states for the democratic decision-making gathering of the city’s free-born men. When Christians began to use the term such semi-democratic city-states were already long gone. The word indicates perhaps the Christian intention of a free gathering of equals. But a gathering transformed from just free-born males to include Roman citizens and non-citizens, slaves as well as the free, poor as well as rich, female as well as male. This was a revolutionary ecclesia representing the people living in God’s kingdom. Truly, the eucharistic assembly, the ecclesia, was a transforming act. In the same way, we gather today as a revolutionary gathering of all sorts and conditions, the people of God, sharing in God’s love. Recognition of this plays a part in the transformation of the worshipping community. We are transformed by our worship in many ways; the one that will be focussed on here is how we are transformed by recognizing in each other the image of God. As the bishop said, we can look to left and right and see the image of God in our immediate neighbours. In most churches we will not generally see the faces of our fellow worshippers during the service, but there too we will find the image of God. This is an ideal: it has to be recognized that not all our services live up to this ideal, not all those who attend are ready or able to participate in this way, and not all our buildings make it easy. We shall explore in future posts how the assembly can address these limitations, how the assembly gives legitimacy to its ministers, how the local assembly is part of a wider assembly across the world. In many situations, a simple explanation to the members of the assembly, both clergy and laity, may be enough for them to begin to realize their vocation, their ministry, as part of the assembly which comes together to worship and to hear and be present with, and be transformed by, the Word of God.